I didn't really know what to expect from this founder member of HAWKWIND - having very little knowledge of the group themselves (except of course the tracks everyone knew). After leaving the group & playing the itinerant musician (apparently uncredited on numerous recordings), he wandered into the Deserts of Egypt, playing his flute & saxophone, soaking up the history & atmosphere of the land, finally coming back to the West with this album of moody tracks which, despite their apparent simplicity are full of texture, depth, colour & atmosphere. "The Awakening" creates the atmosphere of wind-blown mystery with a combination of noise synth, electronics & breathy flute before becoming a more intense, involving piece with stark images over the multiple layers of synth. A slow, dramatic-but-light piece under which appears spoken voice. For some reason this reminds me of CLOCK DVA circa "Thirst". "Thoth" is a faster, more Rock-based thing using fuzzy sustains & eagerly scrabbling lead guitar while NIK's spoken voice reads words about the God of the title in a steady voice. This track might appeal to those who loved SPLINTERED's "Pigmeat" - this is hardly more controlled or passive. "God Rock" slows down the pace a little, keeping the same fuzzy sustain atmosphere & naked drums, creating a colourful but perfect platform over which TURNER casts his words. I guess this has elements of the VELVET UNDERGROUND at their most smooth & interesting. "Anubis" has a strange, more Industrial intro up through which rises another grizzling, growling thing with echo-like drums, dark four-note sequence & sombre voice describing the God who led the dead to Judgement. "Isis & Nephthys" builds a sort of odd snappy Reggae out of an ambient/electro soup. 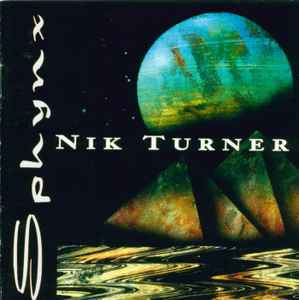 It has a bright, FX-saturated sound with guitar pushing sustains almost to the point of feedback, while NIK TURNER speaks about the sister Goddesses. It kicks up the dust of Ancients towards it's conclusion. "Pyramid Spell" is a slowly drifting thing built out of simple electronic sounds, hissing noise, deep ponderous bass & high dramatic keyboards over which he speaks his words. "Osiris" is another fairly slow thing - sheets of keyboard cast a diaphanous blanket over the simple, bright drum machine. Again words spoken over it - a sort of poem about the great but tragic God. "The Hall Of Double Truth" picks up the pace into a punchy thing with emphasis on the drums. Surrounding this are odd rhythmic sounds & spoken across is a description of a ritual involving Horus. "The Weighing Of Heart And Negative Confession" kicks into even faster tempo, a quick express train of a song acting once more as a steadily growing intense backdrop over which words are spoken in a fairly cold, flat style. "Horus" builds a rhythm over found sounds of Eastern market (a lot more warm & danceable than the CAB's "Eastern Mantra", but in a similar style), showing NIK's fluttering flute as an ethnic image-maker. "Original Sounds From The Great Pyramid" closes the album, a bonus track on the CD which spreads across around 25 minutes - a minimal (yet-spacially-filling) solo flute which rises & falls in descriptive arpeggios, it's mellow tones flying off in echoes into the furthest reaches of imagination. A sort of New Age fantasy with which to conclude an imaginative & fairly unique album.